Obamacare isn't having a good week. The software is failing. The House of Representatives has voted to defund the law. Rising GOP superstar senator Ted Cruz is stoking his presidential ambitions by testing the waters for a filibuster of the budget vote. Libertarians are joining conservatives in praying for the death of the job-destroying, medicine-rationing monster which bears the name of an unrepentant mass-murderer. This is a chart for the signing of Obamacare (inner wheel), juxtaposed with an approximate chart for the passage of the House vote to defund it. It gives us a few clues as to the program's current difficulties. Transiting Neptune trine Obamacare Moon: Yes, it's a trine, and trines are supposed to be nice. But we're talking about Neptune, the bane of clarity and decisiveness, working his blurry magic on the ruler of the Ascendant. This aspect has been in effect almost since the law's passage, making progress and clarity difficult if not impossible. Transiting Uranus conjunct Obamacare Mercury in the 10th: An unexpected energy shift from the governing powers; also, glitches in the technology. Pluto is squaring the Mercury on this chart in a few weeks: bring popcorn and watch the fireworks! Transiting Chiron conjunct Obamacare Midheaven: One of two different transits indicating that Obamacare's weaknesses and infirmities are currently taking center stage. Transiting Jupiter conjunct Obamacare South Node: Jupiter transits usually bring happy expansion and sometimes publicity to whatever they touch... but in this case expansion and publicity are coming to Obamacare's secrets, unresolved issues, and failings. Happy for us; not so much for Obamacare. Transiting South Node trine Obamacare Pluto: A loss of destructive power. This one won't peak for months, but is already close enough to have an effect. Will this insurance-industry shark lose some teeth? 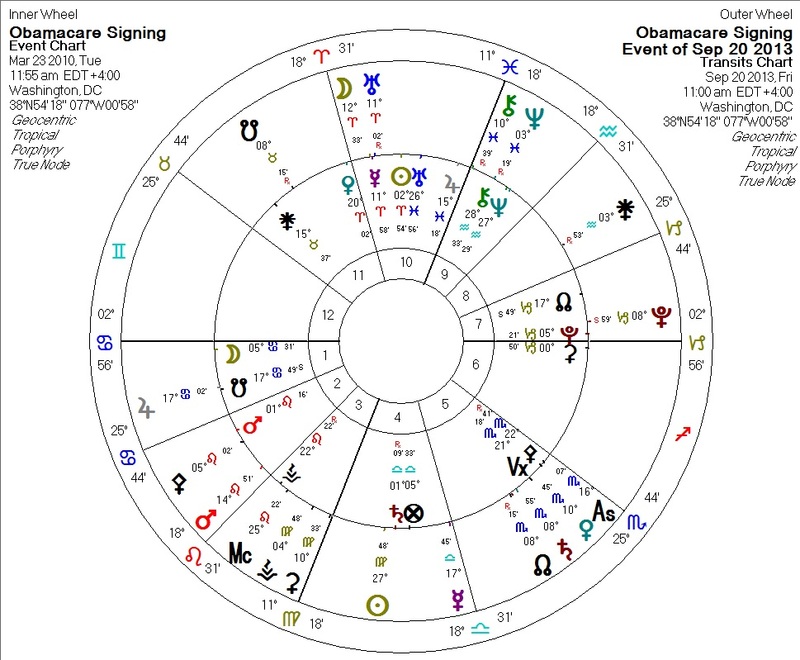 Transisting Mars quincunx Obamacare Jupiter: An open, naked assault on the planet ruling the Midheaven, the authority under which Obamacare operates. Will America kill this thing before it starts killing Americans? The planets give us some hope.